At Wine Enthusiast we respect the importance of providing products that are both luxurious and practical. 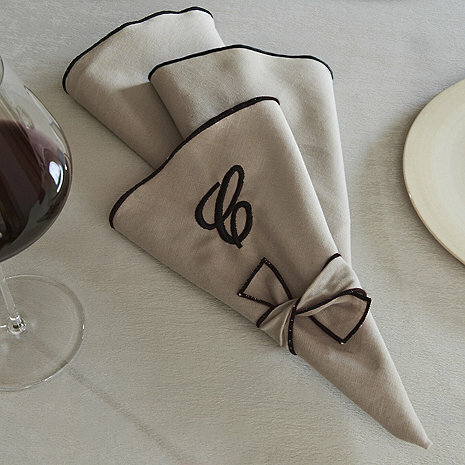 With this in mind, our napkins have a unique eco-friendly coating that prevents wine and other liquids from staining, yet still maintains the lush look and feel of fine linen. Made from a beautiful blend of linen and cotton, our napkins are finished with striking black trim and a matching ribbon. Machine washable.70% Cotton, 30% Linen. Personalization available. 22" Round, Set of 4 with matching bows. Cleaning instructions: Use a damp cloth to remove stains. Do not steam clean.